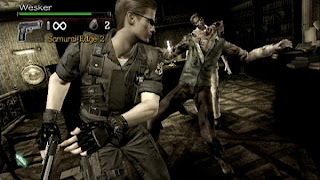 The main chapters of the "Resident Evil" saga have been about solving puzzles, navigating labyrinthine environments and playing target practice with legions of zombies by pumping them full of lead. "Resident Evil: Umbrella Chronicles" is all about the target practice. This first-person rail shooter places players in settings from "Resident Evil 0" through "Nemesis" and beyond, where they must gun down zombie after zombie after mutated dog after tentacled monster. There are no Spade Keys nor Moon Crests to uncover, no electronic doors to unlock and, best of all, no five-second door opening load screens to sit through. The events of "Umbrella Chronicles" are narrated by Albert Wesker, the all-purpose snake in the grass bad guy of several "Resident Evil" games. His story will be all too familiar to fans of the series. The Umbrella Corporation creates a mutagenic virus that turns people into zombies and animals into really frightening animals. The virus then breaks loose, first in a mansion testing facility and then in the surrounding Raccoon City. As a different law enforcement officer or do-gooder in each installment of "Chronicles" corresponding to an original game, you must survive the zombie hordes with sharp eyesight and a sharper trigger finger. "Umbrella Chronicles" plays like fellow zombie rail shooter "House of the Dead." Players travel through environments along a pre-determined path as enemies pop out along the way. The Wiimote is pointed at the screen like "Dead's" light gun and the "B" button serves as the trigger. Re-loading your weapon (accomplished with a shake of the Wiimote) is a crucial point of strategy; firing an empty chamber as a baddie descends on you could spell death. The inclusion of motion controls and quick time events adds massive depth to the point-and-shoot play in "Chronicles." Zombies who grab hold of you can be shaken off with a shake of the Wiimote, while charging bosses can be dodged by quickly pressing the button indicated by an on-screen prompt. Another button cycles through several weapons in the player's arsenal and yet another can be used to swipe their knife when leeches or spiders leap at them. These facets of the game keep players on their toes by preventing them from getting too comfortable pulling only the trigger "B" button with their index fingers. The acute targeting provides steady difficulty in the form of enemies who don't fall down and die (again) whenever you shoot within a foot of their bodies. As in "Resident Evil 4," the zombies react depending where your shot hits. Their knees buckle from a leg shot and their heads jerk back from a head shot. Sometimes vanquishing an enemy requires an almost frustrating degree of precision, particularly the mutated version of Umbrella scientist James Marcus at the conclusion of the "0" chapter. But the challenge is never too steep, and the degree of strategic targeting required to defeat bosses like Marcus and the Tyrant monster can be quite rewarding. As players move through each level they can acquire ammunition and health items by pointing at them and pressing the "A" button. Shooting at breakable objects in each environment uncovers additional treasures. The well-crafted levels levy wave after wave of foes at players, each more menacing than the last, with mild pauses in between that permit exploration. As demonstrated by "Metroid Prime 3: Corruption," "Medal of Honor: Heroes" and now "Umbrella Chronicles," the Wiimote and nunchuk is an ideal and fluid set-up for shooters that make use of the Wiimote's infrared pointer. The Wii Zapper peripheral's uselessness is only further demonstrated by a game like "Chronicles," which demands use of the "A" button - positioned at the top of the Zapper gun - and motion controls, which are awkward to perform with the two-handled gun. In the beautifully creepy environments of the "Resident Evil" series," "Umbrella Chronicles" brings multi-dimensional action to every player who has ever wished for less puzzles and more zombies. And after the pulse-spiking thrill of blasting through corridors full of zombies, the calm of the puzzles may seem a little less boring. Game: "Resident Evil: The Umbrella Chronicles"
The final boss: "Umbrella Chronicles" streamlines the action of "Resident Evil" games, but the thrill of the series' survival horror remains intact.